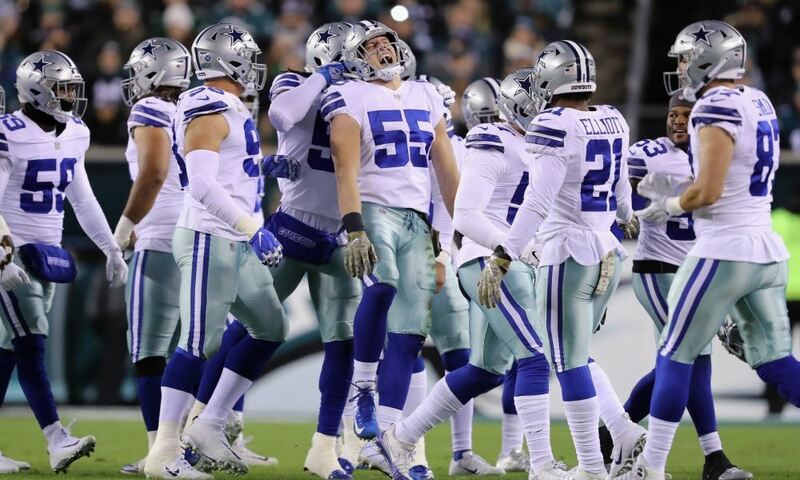 The first half of the season has come to a close and your Dallas Cowboys sit at 3-5 on the season with an uphill battle to contend for a playoff spot. Things look bleak after the America's Team suffered a let down at the hands of the Tennessee Titans on Monday Night Football. 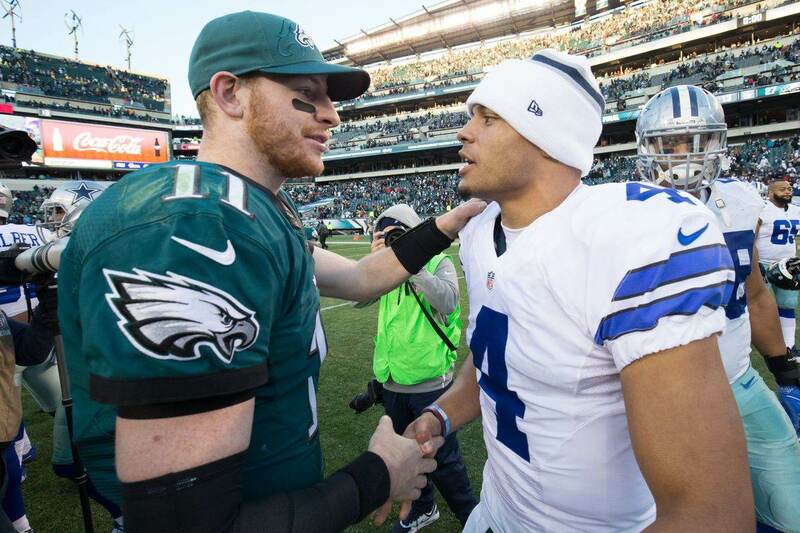 The reality is, however, they are only two games back of the Washington Redskins for the NFC East lead and the Philadelphia Eagles haven't looked like the best version of themselves through the first eight games either. The NFC East remains there for the taking. The next six games looks rough, but if the Dallas Cowboys can pull out a victory on Sunday Night Football, they'll have a chance to keep pace in the division and make the playoffs. Yes, I'm talking about playoffs!!! Before moving further into the season, let's look back and hand out some awards to the best -- and worst -- Cowboys of the first half of the 2018 season. Things haven't been as good as they were in 2016 for Ezekiel Elliott in terms of production, but the guy still has a huge impact on the way opposing defenses play the Dallas Cowboys. If the offense was able to get better protection out of the offensive line and production out of the quarterback, then teams would be forced to back off of the line of scrimmage. As things stand now, teams don't respect the Cowboys passing game and that puts all the focus on Elliott and the run game. Just imagine where the Cowboys would be without Elliott as a threat on the ground. Despite teams stacking the box against Ezekiel Elliott, he's still averaging 4.6 yards per carry, 85 yards rushing per game, and is eighth in the NFL in yards from scrimmage with 906. He's averaging 113 total yards per game, which is down from his 128 average over the first two years of his career, but with how ineffective the offense has been, it's incredible he's gotten that kind of production. After a rocky and slow start to the season, rookie Wide Receiver Michael Gallup has really came on strong in the last three games. In week six he made two nice catches -- though one didn't count -- against All-Pro Jaguars Corner Back A.J. Bouye. He then broke out in a big way in the week seven loss to the Washington Redskins taking three receptions for 83 yards including a long touchdown reception on a nice double move. Again in week nine, he brought in three catches for 51 yards on six targets (a couple of those targets were off-target throws). Gallup is seeing targets all over the field including in the red zone. Even with the addition of Amari Cooper to the wide receiver group, Michael Gallup still saw the second most snaps at the wide receiver position and has begun to show a nice rapport with Quarterback Dak Prescott. Over the last three games, Gallup's caught seven passes for 159 yards and a touchdown while averaging 22 yards per reception. His route running is looking really nice and he's getting a lot of separation from opposing defensive backs. He had a bad drop against Tennessee on a target deep over the middle that he should have caught, but otherwise, the rookie is really beginning to show why he was worthy of the 81st overall pick in the 2018 NFL Draft. The Dallas Cowboys made a mistake not paying Defensive End DeMarcus Lawrence this past offseason, because he's about to bank. If not with the Cowboys than with someone else. Despite his sack totals not being where they were at this time last year, Lawrence is still the best defender on the team -- and maybe in the NFL outside Aaron Donald -- and is playing at an elite level. Through eight games in 2017, Lawrence had 11 sacks. In 2018, he only has seven sacks. He's on pace for 14 sacks all the while being the focal point for every offensive coordinator when they begin game planning for the Dallas Cowboys. Those seven sacks rank 10th in the NFL among EDGE rushers, according to Pro Football Focus. Not only has he been elite as a pass rusher, he's been elite in the run game as well. Again, among EDGE players (4-3 DEs and 3-4 OLBs), he ranks second in run stop percentage (15%) among players who have played at least 117 snaps. He's third in total run stops behind only Calais Cambell and T.J. Watt. The Dallas Cowboys will probably have to put the franchise tag on him again this offseason to prevent a team from money whipping him away from The Star. This past offseason, they probably could have gotten a deal done with him for around $16 million per year over five years. Now they'll likely have to pay him upwards of $20 million per year. That's a huge difference in terms of the salary cap. For DeMarcus Lawrence, the gamble paid off. We've talked a lot about Byron Jones and his transition back to corner back this season, but we're going to keep highlighting him. He's doing everything you'd want from your top corner. Among corner back in 2018, Jones has allowed the fourth fewest receiving yards on the season, the fourth fewest receptions, the seventh lowest passer rating, fourth lowest yards per snap, eighth best snaps per target rate, and the fourth best snaps per reception rate in the NFL, per Pro Football Focus. Teams are figuring out that going against Jones is a losing proposition, so they are looking elsewhere to get their passing game going. He's only been with the team for one game, but you can already see that he's a really good player. He's got elite route running that makes corner backs look silly. He sets up his cuts really well and displayed nice hands in the loss to the Titans on Monday night. Cooper had five catches for 58 yards and a touchdown, including a long of 19. He brings Cole Beasley route running with Brice Butler speed. As he practices and plays more with Dak Prescott, this will become a really nice combination in the passing game for the Dallas Cowboys. Will that lead to more wins in 2018? Who knows, but I think the trade for Cooper is going to reap rewards for several years after this one. For Cooper in Dallas, this is only the beginning. The offense hasn't been good this season and a lot of that falls on the players, but a lot of the blame has to rest on the shoulders of Offensive Coordinator Scott Linehan as well. I've chronicled it several times over the last two games, but I think his personnel deployment has been atrocious. On 4th and 10 on Monday Night Football he called for a personnel grouping that didn't include Cole Beasley or Michael Gallup. Instead, they put Rico Gathers and Blake Jarwin on the field with Allen Hurns and Amari Cooper. When your team is staring at defeat and about to drop to 3-5, you need to have your best and most explosive playmakers on the field at the same time. It truly boggles the mind that the Dallas Cowboys can't come up with a formation that includes Ezekiel Elliott, Amari Cooper, Cole Beasley, Michael Gallup, and Allen Hurns on the field at the same time. Scott Linehan doesn't seem to know what an offense without a tight end looks like and the further this season goes down the road, the more irritating it gets. As egregious as that is, I also don't understand why he uses Jourdan Lewis as the jet sweep option instead of Deonte Thompson, who is, you know, a wide receiver. Since Linehan has been utilizing this as a part of the offensive arsenal, it's always been done by a receiver who was also the kick returner, as Deonte Thompson is. He has the ability to read blocks in space and has the speed to break big gains. Even more egregious may be the involvement, or should I say lack thereof, of Cole Beasley. In the last two games, Beasley didn't really get involved until the final drive of the game, which is a problem that is hopefully rectified by the presence of Amari Cooper moving forward. As Dak Prescott continues to win by going down the field to Cooper and Gallup, Beasley should have more opportunities underneath. Linehan, however, needs to get Beasley involved early to get teams thinking about him so Dak has more room to work down the field. I'll never shy away from admitting that I think that Jason Garrett can be a good head coach in the NFL, because I think he's an excellent motivator and gets great effort out his players, even when there's nothing to play for. See 2015. Despite the "clapper" narrative that follows him around, there are real issues that we can point to and offer criticism. The most glaring is that he's unwilling to assert more influence over the direction of the offense. I don't know if it's out of loyalty to Scott Linehan that Garrett remains hands off with his offensive coordinator or that Garrett doesn't have any ideas on how to fix the offense. Either way, that's a problem. Whatever the case may be, Garrett has been reluctant to take control of the side of the ball that he's most familiar with and that may be his downfall. The offense hasn't looked the same since the Atlanta game last year. Some of that is on the players and some of that is on the coaching. What's frustrating is that the coaches came into training camp talking about a bunch of new wrinkles to the offense and the pieces being good enough to be a contender. 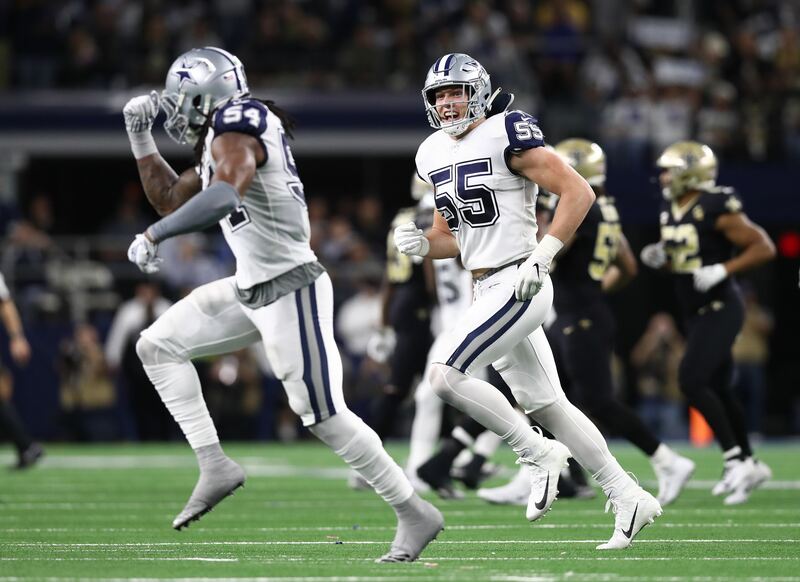 That has not been the case and the failure to truly see the offense for what it is, is a microcosm of the 2018 NFL season for the Dallas Cowboys. I don't know what to believe about Jason Garrett and his future with the Dallas Cowboys, but one thing I know is that if he doesn't begin to assert some influence on the offense, then this season is going to get much worse before it gets better. The bread and butter, the leaders on the team, the identity of the Dallas Cowboys since the 2014 season has been their offensive line. And they have fallen flat through the first eight games of the 2018 season. It's possible that Paul Alexander's technique and style of offensive line play just didn't suit this group of players and that is why they haven't been very good. Or, it could be that their's been a decline in play by Tyron Smith and La'el Collins in particular. Obviously, missing Travis Frederick is a big factor, but Smith and Collins haven't played like their capable of. And with Joe Looney starting in place of Frederick and Connor Williams trying to figure out life on the inside of the offensive line, you can see why the offensive line is struggling. They have to be better moving forward and as a unit will have to be against a Philadelphia Eagles defense featuring one of the best interior players in the NFL in Fletcher Cox. I really don't know what to say about Chidobe Awuzie accept, I expected better from him. In 2017, his rookie season, he flashed some ball skills and a swagger that I though was going to translate very well into Kris Richard's aggressive press coverage scheme. Instead, he's being beat a lot. Even though Awuzie is more often than not in the right space at the right time, he's not making plays on the football that prevent catches. Unlike Byron Jones, who is tied for 13th in the NFL with eight pass deflections. Though he's not been good in coverage, he's held his own in the run game, ranking 11th among corner backs in run stop percentage. Problem is, that to play corner in this league at an effective level, you can't give up a reception once every 6.7 snaps, which is the worst in the NFL among players with at least 205 snaps. What can we say about Quarterback Dak Prescott? He's had some really good games, like the games against the Jacksonville Jaguars and the Detroit Lions. He's had some bad games like the ones against the Seattle Seahawks and the Houston Texans. Then he's had some good moments and bad moments in the same game like he did against the Washington Redskins and the Tennessee Titans. He's been a roller coaster of a player this season and hasn't recaptured the magic that was the first 24 games of his career. Dak Prescott is currently on pace for career lows in pretty much every passing category, including yards, touchdowns, completion percentage, passer rating, He has the lowest passer rating of his career at 88.9, the lowest completion percentage at 62% and is just a touch higher than his 2017 yards per attempt number of 6.8. He's on pace to break his career high in rushing yards by nearly 150 yards, which seems odd since we'd like him to run even more. He's struggled this year, but so has most, if not all, of the offense. Like I mentioned above with regard to Scott Linehan and the offensive line, Dak Prescott carries some of the blame as well. He's been inconsistent and unwilling to let the ball fly at times. He's held the ball too long or he's missed open receivers by not letting their routes develop. And other times, Prescott hasn't had the time or he's hit the open receiver and been let down by a drop. 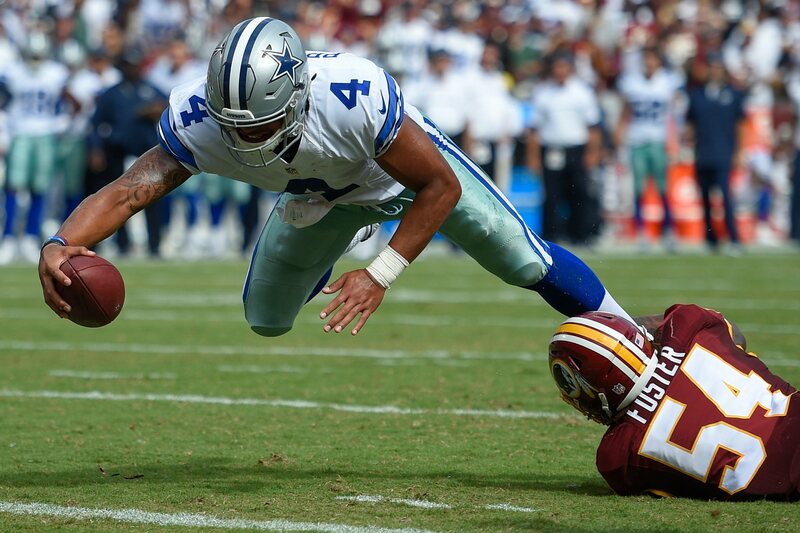 According to Pro Football Focus, Dak Prescott has been pressured on 39% of his dropbacks, which is the third highest rate in the NFL. Only Deshaun Watson holds the ball longer than Dak Prescott. Part of the reason that Dak has had to hold the ball longer than almost anyone in the NFL is that his wide receivers haven't been able to separate even at a league average rate according to Next Gen Stats. Prior to Amari Cooper's arrival, no receiver on the Dallas Cowboys, aside from Geoff Swaim, averaged more than the league average of 2.7 yards per separation. Cole Beasley was the closest at 2.5. What is going on with the offense for the Dallas Cowboys isn't just a Dak problem. It isn't just an offensive line problem. It isn't just a receiver a coordinator problem. It's an everyone problem. It is essentially a "chicken and egg" debate. We could argue it round and round, trying to pinpoint or place blame on one person or unit, when the reality is, the entire offense needs to play better. Who have been your Heroes and Zeros for the first half of the season?